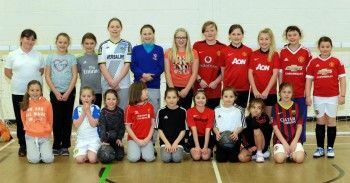 Girls are picking up footballing skills at a rapid pace thanks to a successful coaching programme. Barrow AFC’s Only Girls Allowed scheme is now entering its third year and has seen hundreds of youngsters learn all about the game. Sessions run on Monday and Friday evenings at Furness College, with children aged between five and 11 taking the chance to enjoy their football. Barrow Community Trust awarded the group £1,000 towards their end of half term competitions in March 2016. With the likes of Barrow AFC Community coaches Yasmine Swarbrick and Charlotte Kendall leading the way, the girls take part in skills drills, games and matches in order to improve their game. The parents of the children involved have been delighted with what they have seen and the results of the sessions. One parent, whose two daughters are among the children attending the Monday sessions for children in Years 4 to 6, said: “The girls love coming to these sessions, meeting girls from different schools and clubs. The parents have been pleased with the level of coaching the girls receive at the sessions. Yasmine Swarbrick is seen as a role model for the young players. The Preston North End Ladies player is often joined by Charlotte Kendall, who was originally a volunteer, but who is now being supported on he Level One coaching qualification. The duo also coach the Barrow AFC Girls Performance Centre Under-12s team, but their skills are equally appreciated with the younger, less experienced players. Only Girls Allowed sessions take place on Mondays, between 6pm and 7pm, for girls in Years 4 to 6 and on Fridays from 5pm until 6pm for girls in Years 1 to 3.